Birth and other transformations are undergone by the body but never by the self,just as change occurs for the moon's phases but never for the moon,though the new moon day maybe called the moon's death. The oils of Palo Santo (Bursera Graveolens), of the mark SAINTWOOD, can be obtained in three presentations: Essential Oil, Oily Resin and the combination of both or Palo Total. "TREES THAT PERFUME THE AXE THAT WOUNDS"
EL PALO SANTO (BURSERA GRAVEOLENS) "Belongs to the sacred lineage of the trees that for centuries had been the source of the principal essential oils"
PALO SANTO TREE (Bursera Graveolens) Products are: The essential oil, the resin oil and the natural wood incense. This Products contained a New Vegetal Spirit of the New Age who bring an exotic and great power in it perfumes. How Traitor Filipino Martial Arts Towards Grand Master Gloria Blancia Thirnish Family. we students and friends family. Grand Master Gloria Blancia Thirnish videos and stories. "Today, millions of people are consuming countless hamburgers, steaks, and roasts, oblivious to the impact their dietary habits are having on the biosphere and the very survivability of life on earth. Every pound of grain-fed flesh is secured at the expense of a burned forest, an eroded rangeland, a barren field, a dried-up river or stream, and the release of millions of tons of carbon dioxide, nitrous oxide, and methane into the skies." from "Beyond Beef" by Jeremy Rifkin. Swami Vivekananda, the chief disciple of Sri Ramakrishna Paramhansa, is one of the great yoga masters who shared his teachings in the West. The link below is about his life as it is shown in comics. Language: Spanish. 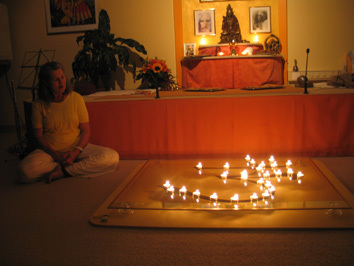 Today is Diwali, the Indian Festival of Light. May your inner light shine forth - may you attain peace and happiness. May your Meditation lead you to the realization of that light within. MOTHER DURGA! Rider on the lion, giver of all strength, Mother, beloved of Siva! We born from thy parts of Power, we the youth of India, are seated here in thy temple. Listen, O Mother, descend upon earth, make thyself manifest in this land of India. Dhanvantari Jayanthi (Dhanvanthari Jayanti or Dhanwantari Jayanti) is the third day of Diwali festival. Dhanvantari Jayanthi is also known as Dhantrayodashi or Dhanwantari Triodasi or Dhanteras. As you know, on the day of Dhan teras people worship Sri Mahalaxmi, the Goddess of wealth and prosperity. People also worship Dhanvantari, the God of Ayurveda on this day. Who is Lord Dhanavatari ? Late Legendary Grand Maître Angel L. Blancia from Panay Island, Iloilo City Area Arevalo in the Philippines. Kung Fu Filipino Martial Arts & Yoga. Hilot Kung Fu Massage & Yoga Therapy Massage. I'm the daughter (Grand Master Gloria Blancia Thirnish) of Grand Master Angel L. Blancia.